One of the undeniable facts about soil is…the spaces between soil particles are as important as the particles themselves. This is where the Soil Food Web, the life of the soil, operates. In the gaps between soil particles. Soil Structure arises from the physical properties—the sizes, shapes, and composition—of the soil particles, and the way the life in the soil arranges them. Bacteria are omnipresent. They’re the most successful organisms on the planet, with enough diversity to sustain toeholds in even the most extreme conditions, from hyper-acidic mine runoff to ocean thermal vents. Soil—soil is easy, for bacteria, soil is a vacation in the Bahamas. The Soil Food Web | Why is Soil So Important? Bacteria are also sticky. They release gluelike (“colloidal”) substances so they can stick to their food source, and bind soil particles around them to hide from predators, forming microscopic clumps, or microaggregates. The gaps between are called micropores. The hyphae of soil fungi then thread their way through and around these microaggregates, binding them into soil aggregates, or larger, variable clumps, with channels known as macropores in between. Water, air, and roots pass through these channels. Macropores and micropores work together to regulate water availability for plants. Excess rainfall drains through the macropores into the subsoil, but the micropores retain soil water that plants can later draw on. There are many different types of soil. The differences arise from the type of parent material, the weathering and sorting processes that produced it, the types and numbers of organisms that live in the soil, and the plant communities on the surface. Alluvial Soils are soils whose particles are ground down and sorted by glaciers or flowing water. In Loess Soils, wind is the agent that shapes, sorts, and deposits the soil particles. Soil is made of weathered parent rock, air, water, and organic matter. One of the little-known facts about soil is that air and water make up roughly half the soil volume, with the proportions varying depending on how recently it rained and how fast water drains through the soil. Weathered parent rock makes up most of the other half of the soil volume, about 45%. One of the more curious facts about soil, is that the organic fraction—which includes both dead and decaying organic matter, and the biomass of living soil organisms—accounts for less than 5% of the soil volume in conventional farm soil. 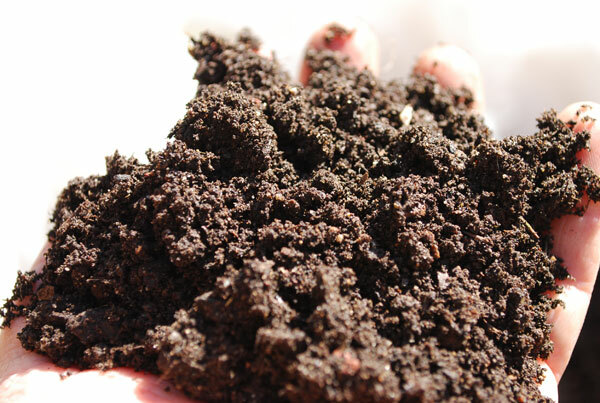 In a well-maintained organic vegetable garden soil, the organic fraction may reach 10% of soil volume. It still doesn’t sound like much, but every percentage point increase in soil organic matter fuels a proliferation of soil organisms, from bacteria to worms. And all of these organisms are peeing, pooping, dying, and decomposing right at the root hairs of your vegetables. “Feed the Soil to Feed the Plants” is an organic gardening maxim. This is how it works. For more information, see The Soil Food Web. Nutrients are said to be immobilized in the bodies of living soil organisms, and mineralized into plant-available form when the organisms die and are broken down, or when they’re eaten and excess nitrogen and other nutrients are excreted into the soil. 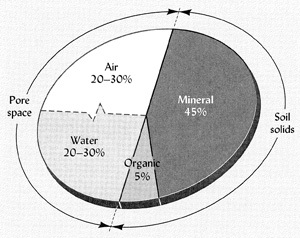 The Soil Texture Triangle describes the Mineral Portion of soils. The shapes and sizes of the soil particles determine how tightly they pack together, which influences drainage and the mix of soil organisms that can survive there. Each edge of the triangle represents one of the primary soil components: Sand, Silt, and Clay. In the middle, where the percentages of sand, silt, and clay are about equal, is the goldilocks zone, loam soil. Coarse Soils are sandy soils with large particle sizes that allow easy root penetration, but they often drain too quickly and hold little water. See Gardening in Sandy Soil for ways to improve sandy soil. Medium Soils are the best agricultural soils. These loam soils contain a mixture of sand, silt, and clay, in roughly equal proportions. They retain water better than sandy soils, and tend to have a higher organic content. They drain better than clay soils. 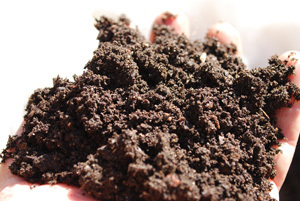 See Improving Garden Soil for ways to improve loam soil. See Changing Soil pH for ways to adjust soil pH and improve garden soil. Fine Soils tend to be higher in organic matter, mainly due to compaction. The tiny, pancake-shaped particles of these clay soils pack tightly, leaving little pore space. Clay soils drain poorly, so the air spaces between particles are often flooded. Anaerobic conditions favor soil and plant pathogens. See Improving Clay Soil for ways to increase drainage and improve clay soil. Soil is the basis of agriculture, and agriculture is the basis of civilization. Without agriculture, humans would never have been able to concentrate in towns and cities. Human populations would have remained small and nomadic. Regulates Water Availability and Quality . Permeable soils allow water to penetrate deep into the soil, instead of running off the surface and creating erosion problems. Soils act as filters to remove surface impurities in the process of recharging groundwater. Provides habitat for soil organisms that act as Nature’s recycling system. Soils harbor the organisms responsible for converting animal waste—and the bodies of dead animals—into plant-available nutrients that can cycle back through the ecosystem. See The Soil Food Web for more information on this vital ecosystem under our feet. But why is soil so important for the gardener? Physical Support for plants. Plant roots penetrate the soil and anchor the plant to support above-ground growth. Mineral Nutrients that support and sustain plant growth. Water Retention and sustained release of moisture to plant roots. Aeration for plant roots. It’s one of the less obvious facts about soil, but roots—and the life that encrusts them—need to breathe, too. Protection from Toxins—soils ventilate gases, break down organic toxins, and suppress microorganisms that produce toxins. Vigorous plants are a pillar of organic garden pest control. Pests zero in on weak plants, while plant vigor puts them off. Healthy soil is the key to producing the kind of robust, vigorous plants that repel insect pests.